Guterres stressed that the solution to protecting Palestinian civilians is a political settlement to the decades-old Israeli-Palestinian conflict. United Nations: Secretary-General Antonio Guterres said in a new report that options to protect Palestinian civilians under Israeli occupation range from establishing an armed military or police force to deploying civilian observers or beefing up the UN presence on the ground. But the prospect of getting Israel’s consent, especially for a UN or non-UN armed force, remains highly unlikely. * A MORE ROBUST UN PRESENCE ON THE GROUND: He said additional UN human rights, political and coordination experts could strengthen UN prevention capabilities, increase the organization’s visibility and “demonstrate the international community’s attention and commitment” to protecting Palestinian civilians. * ADDITIONAL RESOURCES AND BETTER ACCESS TO ENSURE THE WELL BEING OF CIVILIANS: He said expanding current UN programs and humanitarian and development assistance could more effectively address Palestinian needs. But he said the UN appeal for about $540 million for basic services and support to 1.9 million vulnerable Palestinians is currently only 24.5 percent funded. And he said major cuts in funding to the Palestinian refugee agency, UNRWA, “have created an increasingly complicated and desperate socio-economic environment.” This was a reference to the U.S. cut of around $300 million in funding for UNRWA earlier this year which has resulted in a $217 million budget shortfall. * DEDICATED CIVILIAN OBSERVERS: He said establishing a UN or non-UN civilian observer mission with a mandate to report on the protection of Palestinian civilians and their well-being “would particularly be relevant in sensitive areas such as checkpoints, the Gaza fence, and areas near settlements.” He said the observers could provide local mediation. * PHYSICAL PROTECTION: He said the UN could provide armed military or police forces, if given a mandate by the Security Council, “to deter and, if necessary, ensure the safety of the civilian population.” As an alternative, he said a group of “like-minded” countries operating under a UN mandate to provide physical protection rather than a UN mission. Guterres stressed that a UN civilian observer mission or a new military or police mission established by the UN, or operating under a UN mandate, would require Security Council approval. He also noted that UN missions currently operating in the region don’t provide for the protection of civilians and it would be up to council members to expand mandates to include protection. The Palestinian Authority “incites its people to demonize and attack Jews, and Hamas, a terrorist organization, exploits those under its control by intentionally putting them in harms way,” Danon said. The Trump administration has been a strong defender of its close ally Israel in the council, and vehemently opposed the resolution approved by the General Assembly in June that called for Guterres’ proposals. So the chances of a U.S. veto in the council on any armed force to protect Palestinian civilians or a civilian observer mission are high. 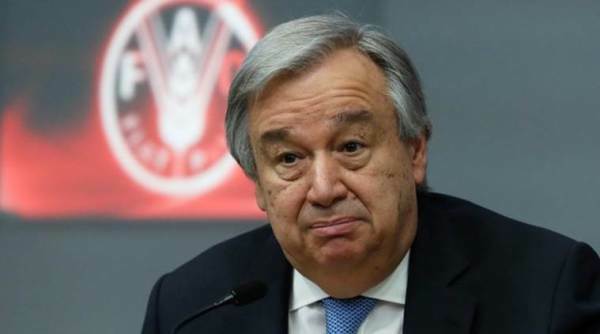 Guterres also criticized “the indiscriminate launching of rockets, mortars and incendiary devices from Gaza by Hamas and other Palestinian militants towards Israel” and the building of tunnels into Israel, saying these acts threaten the lives of Israelis and Palestinians alike.